Global Risk Insights is your online source for political risk analysis. Every day, our global network of analysts identify and analyze political risks around the world and assess how they are impacting economic & business climates. Our goal is to help businesses and investors understand and adapt to these political risks and opportunities so they stay ahead of the competition. Our analysts range from current and former members of the US intelligence community, the financial sector, diplomatic corps to the Obama administration. 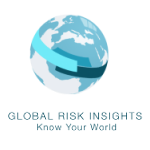 Global Risk Insights’s daily analysis is widely referenced by the media, including the BBC, The Wall Street Journal, CNBC, Reuters and many more.